The Mini USB 2.0 standard A Type has a plug size of 12mm width and a height of 4.5mm. Suitable in all USB 2.0 ports which is standard in every PC. Data transmission is possible in both directions. The Flash drives offer simple usage in stylish and fresh colors in Redrose, Purple and Yellow to suit your personal taste. Whatever you’ve got to share with your family and friends, it’s more fun with Toshiba. USB 2.0 StandardThe Mini USB 2.0 standard A Type has a plug size of 12mm width and a height of 4.5mm. Suitable in all USB 2.0 ports which is standard in every PC. Data transmission is possible in both directions.Fashionable DesignThe Flash drives offer simple usage in stylish and fresh colors in Redrose, Purple and Yellow to suit your personal taste. 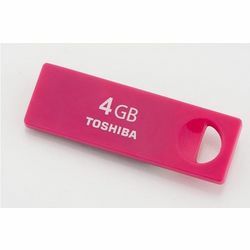 Whatever you’ve got to share with your family and friends, it’s more fun with Toshiba.Lightweight and compactThe USB flash drives weigh only 1 g and are therefore perfect for carrying all of your data wherever you go! They are ideal for portable devices such as notebooks, tablets or digital frames.One of the Lowest Power Consumption in the IndustryLow power consumption is achieved thanks to Toshiba’s original technology, such as multi-layering of high-speed NAND flash memory and a dedicated low-power-consumption ASIC controller. As a result, power consumption of notebook PCs is minimized even when using a USB flash memory.5 Year WarrantyThese Flash drives are covered by a five year warranty from the date of purchase.